With the advancement in technology and processes, there has been a growing need to develop applications in a faster, more effective and efficient manner. But it is often tedious to start coding all over again in a specific language to develop a new application, it is easier to use an existing code instead and just modify and add what is required further. The code which is available to the public for use and to develop further for making an existing application more productive is called an open source. General access via a free license to any product’s blueprint or design. The general redistribution of the blueprint or design, which includes consequent improvements to it. The open source code has enabled a rather self-developing diversity in communication paths, production models as well as in interactive communities. 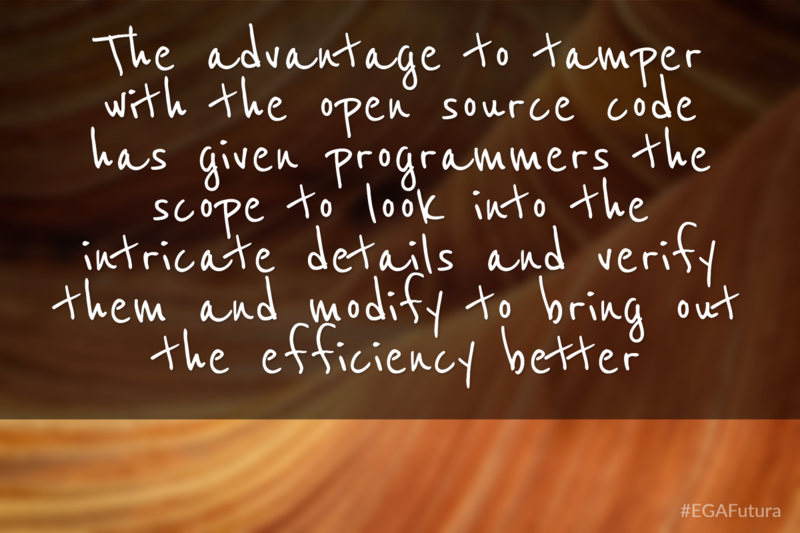 ‍The advantage to tamper with the open source code has given programmers the scope to look into the intricate details and verify them and modify to bring out the efficiency better. ‍Since the open source can be altered, it gives programmers the scope to make it compatible with new hardware and technology with advancement and adding additional features. The source code can be adapted to the changes easily, and a detailed analysis of the system can be done by studying the open source codes. This is one of the reasons why programmers believe that in order to extend the usability and lifetime of any application, the code should be made available to the public for further study and analysis, allowing them to change and alter it so it can be made compatible with more and more hardware in due course of time, or use it to develop a new application altogether. And reuse more than a single open source code, combining them to produce a new one which is better, more efficient and exudes better results is a great outcome of letting everyone have access to open source codes. This way the modifiability of applications has been shared by many communities sharing similar interests, changing the code and making the new code available to everyone like the original code. Which in turn has ensured that more number of developers, have worked on the application’s source code to produce a new version. This process has significantly helped improve the quality of the open source code and has made the applications more functional and efficient, ensuring more and more users try out the application. There is no possibility of ‘black boxes’ anymore. The fact that users can get access to the source code and change the logic according to their necessity leaves no scope for hiding information about the coding. This is why some companies that inscribe their source codes have ‘international patches’, which are a set of augmentations that have legal problems in many countries. These ‘international patches’ include support that enable encrypted communication, and thus can be used legally. This is why some of the companies that come up with their applications choose it make it open source. A company that uses this application counts on the software company to upgrade the software for better performance. If the manufacturer decides to discontinue the application, no one can take the code and alter it, thereby promoting the discontinuation of the software. This problem is rather amplified by the mergers in the software market today, leading to ‘cannibalization’ of some of the software products while allowing only a few to be in the market. Open source code effectively puts an end to this, so the software never gets discontinued and can be developed and put to better use. Working knowledge of the applications can be attained for a less price. Internet software has become a very important factor for programmers, students and people studying the software today, they can easily get hold of the source code without needing to purchase them. Open source application used expertise such as Web-based Enterprise Management and Common Information Model. These high-end technologies help you to integrate, combine servers, applications, services and workstation management etc. This enables efficient organization. These were some of the disadvantages with vendor lock in. Using open source code gives you freedom and you can effectively tackle the disadvantages. There are options to cluster, balance the load, one can enable one’s company to scale up and consolidate as required. With this, one can always go for older hardware and yet benefit from it using the open source code.